I’ve got a couple of new recipes on the menu this week. I think we’ll like them! The Tex Mex Chicken Skillet and the Parmesan Chicken & Broccoli Pasta are the new ones. Does anyone else like to incorporate a new recipe or two each week, or am I the only one that gets bored easily? So, what do you have planned for the week? 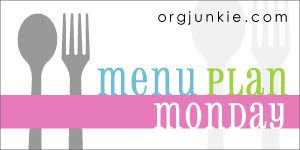 Again, if you would like to see many more menus visit I’m an Organizing Junkie! Yummy! Looks like a delicious week at your home.